One Day Only!! 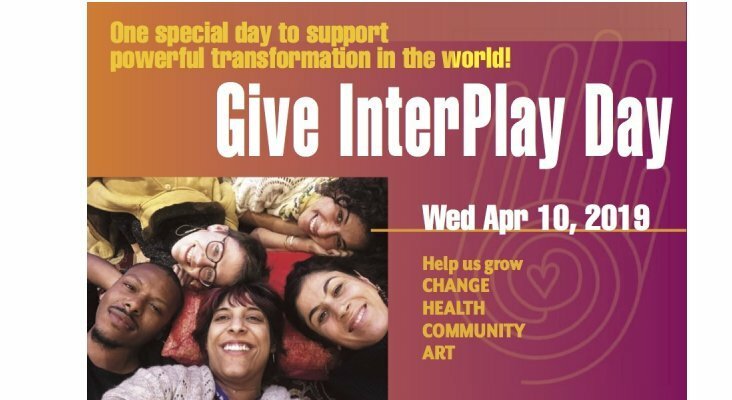 If you want to participate in Give INTERPLAY Day, join us right here from midnight to midnight on April 10th. Invest in gifted leaders to learn the tools of InterPlay to change the world. InterPlay New England needs your support to create regional gatherings, art responses as well as scholarships. A small but mighty group of Millennials are launching a new region. The Raleigh-Durham area is committed to raising funds for scholarships for leaders of color, millennials and full-time artists/activists. InterPlay in the Twin Cities needs support in maintaining the thriving community through scholarships to attend the national Leaders Gathering, Life Practice Programs, and Leader Training programs. InterPlay Washington DC also needs funds for Leader Training program scholarships, as well as supporting Changing the Race Dances happening nationally. Support any of our local projects! If you would like to donate to multiple projects, you need to check out multiple times. Thank you for your generosity! InterPlay’s approach reconnects people to the wisdom of the body, fostering community, ease and grace among people from all walks of life. Many discover that magic happens when we tell our stories, sing our songs, and dance our dances in love and service. InterPlay has created real ways to build human community grounded in what human beings naturally and organically need for spiritual and emotional health. I give today that all might have access to this empowerment! So happy to be a part of and contribute to this life-transforming, global movement. Keep up the good work! Forever grateful for InterPlay in my life, and my InterPlaymates, near and far! So grateful for the gift of InterPlay in Atlanta and the world! Go InterPlay!! I love InterPlay because I didn’t have to be exceptional to do it and enjoy it!! InterPlay is my life practice! It has influenced almost every aspect of my life, making me more resilient, happy, flexible (both physically and mentally), and connected to myself and others. Join me in making sure InterPlay in the Twin Cities continues to thrive and grow! InterPlay is a life balm revitalizing the world. So happy to contribute. Celebrating Interplay and the amazing impact that it has on the world! Thank you for the impact in my life!! So grateful for all of the work InterPlay Atlanta is doing & really lucky to be a part of it! New InterPlay Leaders bring inspiration, creative expression and embodied wisdom to our communities! YEAAAAA! I'm honored to give toward bringing new leaders on board - new communities, new ideas... old wisdom! Sustaining International Sisters (SIS) with InterPlay and Potluck is bringing together a global community of women to inspire and support one another. As co-founder of SIS with Canan Arikan, I support the work we do with time, spirit, and here a donation to ensure we have a space to play and that those who are invited can come to play without the need to pay. We ask for donations but want all women to attend who desire to participate.